You may have seen that I am supporting Tim Ferriss' drive to raise money in order to build schools in Vietnam (on the right sidebar on this page). Education is always a great purpose. Now, today's New York Times writes about another great educational purpose. 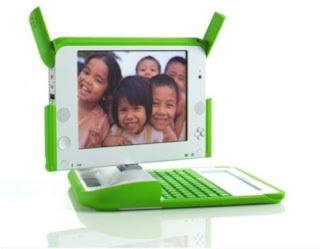 You may have heard about the One Laptop Per Child effort that has been going on in order to get all poor, educationally underserved children of the world (two billion) a laptop for US $100 per child. That has gone up due to a number of issues to $200 per child, and people can participate in this effort in November by purchasing two: one for a child in a developoing nation, and one for the child at home.